WENATCHEE, WA — Behind the right arm of starting pitcher Alec Gomez, the Wenatchee AppleSox defeated the Victoria HarbourCats for the second time in as many days with a 5-2 series clinching victory at Paul Thomas Field. For the HarbourCats, who came into this series winners of five of their past six games, including a three game sweep of the Walla Walla Sweets, the loss put them three games behind the division-leading Pippins with four games left on the season. Gomez, a righty out of Yakima Valley College, got the nod for the ‘Sox on the mound and after only allowing a combined six hits in his past two starts, provided Wenatchee with a quality start tonight. However it was the visitors that got on the scoreboard first in the second inning, as the HarbourCats capitalized on some AppleSox miscues in the field. Mike Malinchak started the frame with a single, and after Gomez got two quick outs, the righty uncorked a wild pitch with allowed Malinchak to advance into scoring position. Blake Wagenseller then smacked a line drive to the Wenatchee third baseman who had trouble handling the ball, which allowed Wagenseller advance to first and for Malinchak to score from home to draw first blood for Victoria. Meanwhile, Garrett Goodall got the call for the HarbourCats on the hill, and would only allow a single hit in just two innings of work, but was taken out to start the third inning in favour of Nathan Walker. 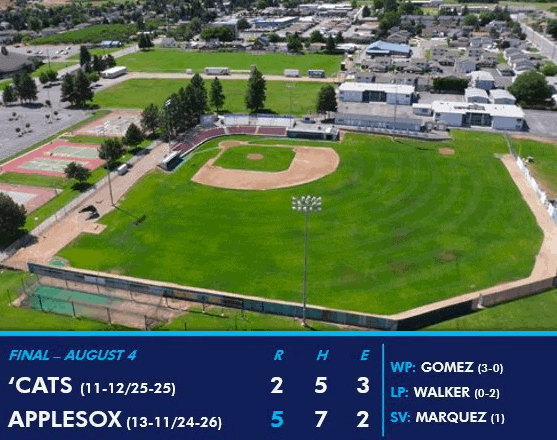 With a new pitcher on the mound, the AppleSox pounced on Walker with a run in the fifth before a four-run sixth sealed the game. Conor McCord started the scoring in the sixth with an RBI single, and two batters later JT Schwartz followed his teammate up with a two-run shot to make it a 5-1 ballgame. The HarbourCats responded in the top half of the seventh, as Harrison Spohn started the inning with a leadoff walk, and moved to third off a Gomez wild pitch — his third on the evening. Wagenseller then brought Spohn home with a deep sac-fly that brought Victoria within three. Gomez would exit after the seventh, collecting seven strikeouts to just three walks, and only being charged for one earned run in seven quality innings of work. Brain Marquez would come in for relief of Gomez, and only allow a single hit in the final two innings to preserve the AppleSox victory. Victoria would be held to just five hits throughout the entire game. With the Yakima Valley Pippins losing for the second consecutive night to the Walla Walla Sweets, the AppleSox climbed to within a game and a half of first place in the North division. The two teams will renew hostilities tomorrow night, as the HarbourCats will look to salvage the series in their final road game of the season. First pitched is slated for 6:00p.m.